Well, there's no hiding from it now. 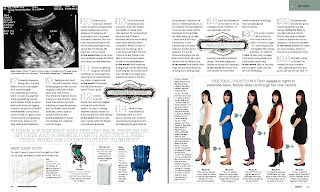 My pregnant belly is inescapable in the latest issue of real living, which went on sale yesterday. No doubt, I'm going to look back on this feature in years to come and think, "what am I wearing!!!". You'll know what I'm talking about when you see the progress shots. There are more behind the scenes photos on the editor Deborah Bibby's blog. I loved this feature :) Plus i think you looked great! You had a great pregnancy wardrobe (and ah those heels!) I especially loved "meeting" your little one! you look great and your baby is just beautiful! a lovely feature in a great issue! It's amazing when I look at the photos of Charlie because now it seems he's almost double the size. The photos were taken when he was four weeks old but now he is 11 weeks old. I love the issue too. It's the first one that I have seen as a reader. My favourites would have to be the "real girls", "colouring in", "tiny space, big ideas" and the travel feature. I also love the "maximum style, minimum fuss" - it will be a good read no doubt as Clair Wayman is incredibly thorough. Aw, Kris. That's sweet of you to say. 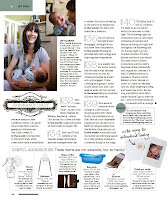 It's never easy to see yourself in print, and the whole shoot day was a bit nerve-wracking for me because Charlie was so young and very much in his crying phase. Thankfully, he's settled down a lot now and sleeps during the day too. Woohoo! You look so lovely and your baby is gorgeous!!! Kris and SimplyGrove - yes, Charlie is even more beautiful to me when he sleeps - haha, if you know what I mean! agree with everyone above, you both look fantastic! real living is such a refreshing read. its must be hard for magazines to keep on the cutting edge of interior/design news in this age of blogging but real living never makes me frustrated about reading "old news". dont even get me started on vogue living! Jenny, I think you're completely right - about mags, that is. Since blogs have taken off I think mags have to rethink their place in the design world. Blogs are going to be quicker in many regards. But there are many blogs that also tend to circulate the same images over and over again, which I find quite boring at times. That's why I love interviewing people and getting snap shot of their creative world because it's original content. I think where mags succeed over blogs, though, is that magazines are highly edited and, again, the content is original - photography, styling and writing is commissioned. And, I hate to say it, but I was disappointed with the latest issue of Vogue Living as well. I'm an Aust author, trying to contact you - I wonder whether you could email me? My email address is nwalton@acpmagazines.com.au if you want to contact me directly. Thanks, Lucy. I have to say that the photographer Damien and my mum were great at allaying any nervousness I had about the shoot. Damien has a baby too so it made all the difference knowing this. It meant he was not going to get freaked out when Charlie was getting grizzly. Phew!